Indra Nooyi Pepsi CEO have joined US elected president Donald Trump Strategic and Policy Team. She will advise the president on job creation and government policies. Along with Pepsi CEO Indra Nooyi,Tesla/SpaceX CEO Elon Musk and Travis Kalanick, CEO and Co-Founder of Uber were announced as member of Donald Trump Strategic and Policy Team. 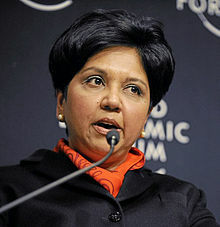 India-born Indra Nooyi, naturalized American, business executive and the current Chairperson and Chief Executive Officer of PepsiCo have been ranked among World’s 100 Most Powerful Women. With more than $63 billion in annual net revenue, and more than $35 billion in the United States alone, PepsiCo makes hundreds of enjoyable foods and beverages that are loved throughout the world. Earlier this month, President-elect Trump established the President’s Strategic and Policy Forum and announced an initial round of 16 members. The Forum, which is composed of some of America’s most highly respected and successful business leaders, will be called upon to meet with the President frequently to share their specific experience and knowledge as the President implements his economic agenda. “America has the most innovative and vibrant companies in the world, and the pioneering CEOs joining this Forum today are at the top of their fields,” said President-elect Trump. Members of the Forum will be charged with providing their individual views to the President — informed by their unique vantage points in the private sector — on how government policy impacts economic growth, job creation and productivity. Donald Trump will take over as president on January 20, 2017. India is on track to become cashless country.